Percentage of sandy coast very likely (probability > 90%) to experience coastal change during Hurricane Sandy landfall. Elevated water levels and waves during tropical storms can lead to dramatic coastal change through erosion of beaches and dunes. USGS has developed a storm-impact scale that predicts the likelihood of coastal change by comparing modeled elevations of storm-induced water levels to known elevations of coastal topography in order to define three coastal change regimes. These regimes describe how beach morphology (physical form) and storm processes tend to interact, and the resulting modes of coastal change along beaches and dunes, which often serve as the "first line of defense" for many coasts exposed to tropical storms and hurricanes. The three regimes are collision, overwash, and inundation. Collision occurs when waves attack the base of dunes and cause dune-front erosion. Under higher surge or wave runup conditions, waves can overtop dunes leading to overwash, which can include dune erosion, landward dune migration, and overwash deposition on low, narrow islands. In extreme cases, such deposition can bury roads and parts of buildings. The most extreme coastal change regime is associated with inundation, where the elevation of storm surge plus wave setup exceeds the elevation of the primary dune or beach berm. Under these conditions the beach and dune can be severely eroded and low, narrow islands may breach. 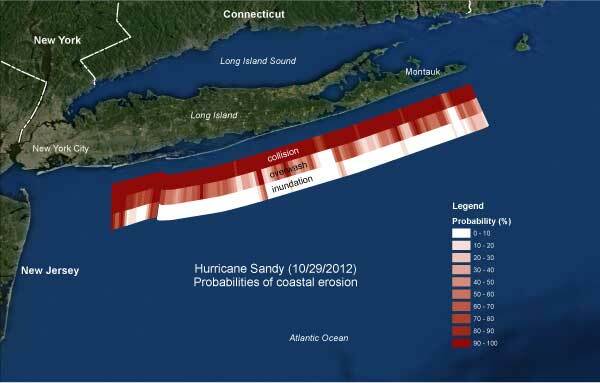 The probabilities of collision, overwash, and inundation associated with Hurricane Sandy were assessed for the sandy beaches from the mouth of the Chesapeake Bay to Long Island, NY. 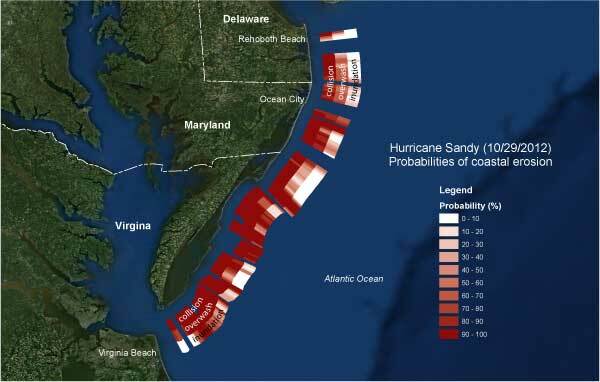 Click on the images above to see the probabilities of collision, overwash, and inundation for the sandy beaches from the mouth of the Chesapeake Bay to Long Island, NY. Coastal change probabilities give the likelihood that the beach system will experience erosion and deposition patterns consistent with collision, overwash, or inundation regimes. 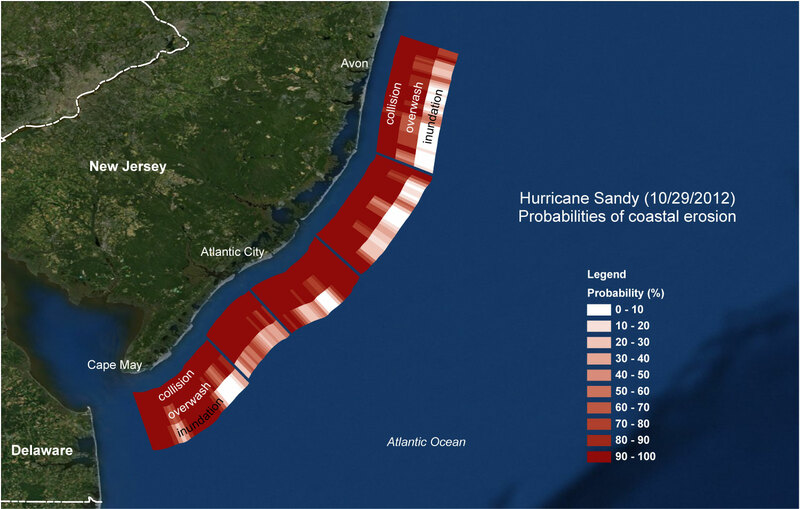 The probabilities were estimated by calculating the difference between modeled total water levels (including tide, storm surge and wave runup) and dune or berm elevations. The calculations assumed landfall at high tide, as represented by the 20-year mean high water level. The storm surge elevations along the open coast were obtained from the National Oceanic and Atmospheric Administration's (NOAA) probabilistic surge forecast (psurge), which is based on conditions specific to the landfalling storm. Errors in hurricane forecasts are included in order to identify probable surge levels. The 10% exceedence surge level was used to represent the worst-case scenario. Maximum wave heights obtained from the NOAA WaveWatch3 model 7-day forecast were used to compute runup elevations. Dune elevations were extracted from lidar surveys. In the maps below, red colors indicate high probability while white indicates low probability. 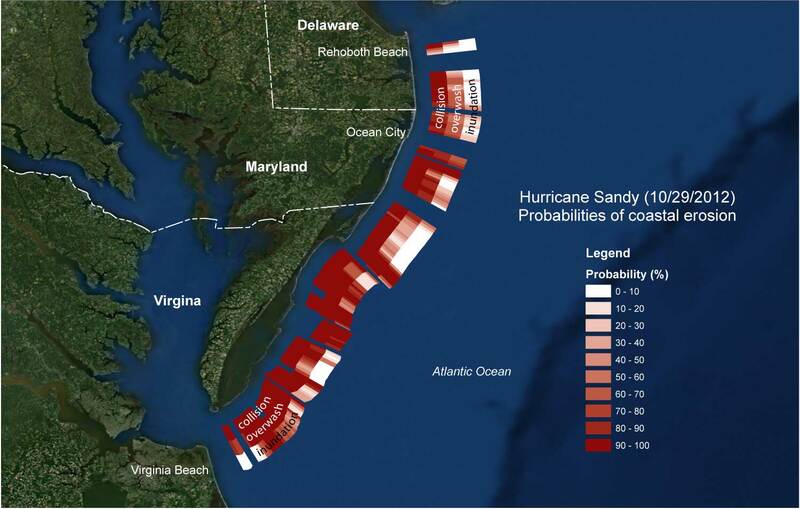 The probabilities can be interpreted as indicating that the specified coastal change regime is very likely (probability >90%), likely (>66%), about as likely as not (33% to 66%), unlikely (<33%), and very unlikely (<10%) given the present storm forecasts. Download KMZ file of data for viewing in Google Earth. Use of trade names in this report is for identification purposes only and does not constitute endorsement by the U.S. Geological Survey.